Few cars of the last 30 years have proclaimed “I don’t care” as quietly as the Subaru Justy. The little hatchback was about as athletic as Kevin James, with easily overlooked styling to match. 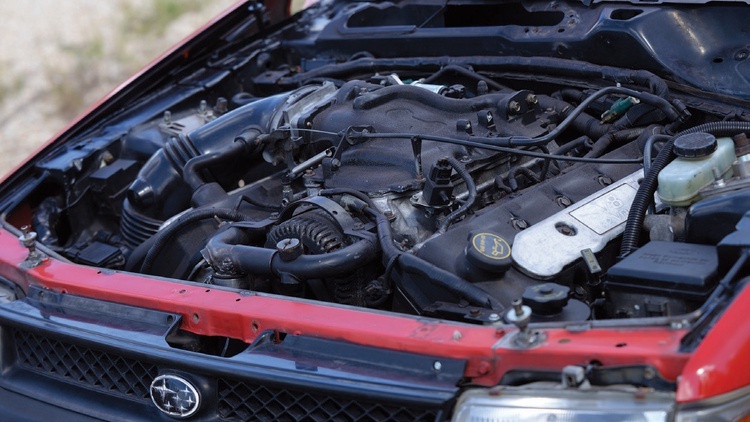 Although it served its purpose as a city economy car in the ’80s and ’90s, it managed to remain one of the most unrecognized cars that Subaru has produced in the recent past. 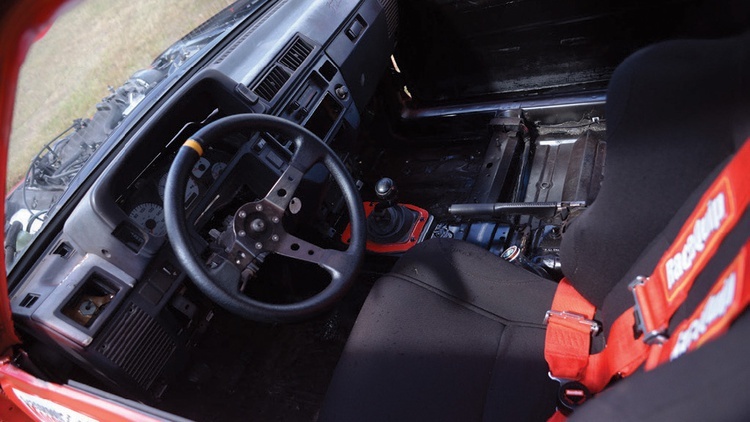 Understand, then, the blend of confusion and excitement we felt when we received Circuit Motorsports’s entry for our $2015 Challenge: a 1993 Justy. That excitement was further stoked at the event itself as we watched them unload a bright red ball of fury, complete with massive box flares. This wasn’t just any clapped-out hatchback tarted up for the weekend. A glance at the massive brakes and rear-mounted radiator hinted at something spectacular. 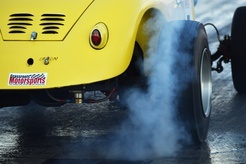 Indeed, as the car roared to life, the recognizable rumble of a V8 turned heads in the paddock. Once we had a chance to converse with the Circuit Motorsports crew, we realized the full gravity of what was growling in front of us. They had managed to shoehorn a full Mustang Cobra into a tiny Subaru Justy. 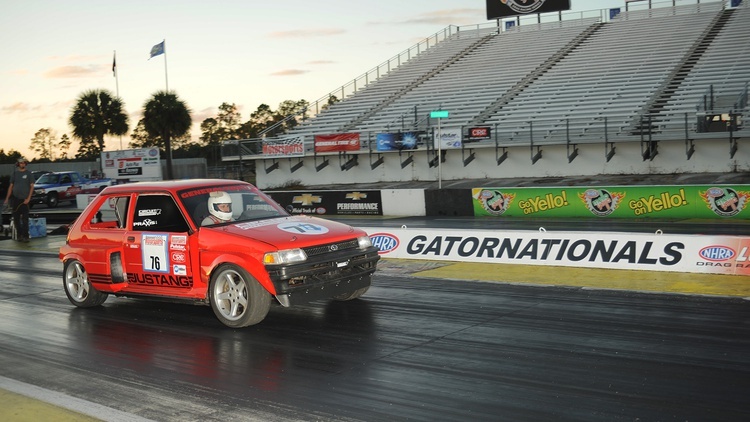 Circuit Motorsports is a performance shop in Orlando, Florida, that specializes in making Subarus go fast–like, really fast. And when they decided to enter our Challenge, they wanted to do something with a Subaru that no one had ever done before. Shortly thereafter, they stumbled upon a Justy with a blown engine. Its seller was only asking $100; the game was on. Looking to venture into unchartered waters, the team started spitballing ideas for the project. At one point in their conversation the name Justang was thrown out. Catchy. Now they just had to figure out what, exactly, a Justang would be. Past Challengers had already dropped V8 engines into tiny hatchbacks, but the Circuit guys figured out a way to one-up this concept: How about taking every bit of a star-spangled V8 Mustang and cramming it into this econobox? Thus was born the idea to fit a Subaru Justy with the entire running gear from a Ford Mustang–drivetrain, suspension, everything. Ambitious? Sure. Worth it? Absolutely. 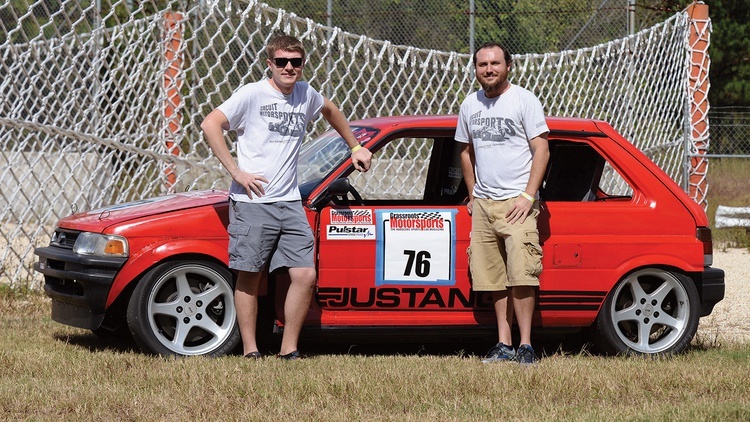 The original plan was to use the popular 5.0-liter powertrain from a Fox-body Mustang, but after a couple of test drives, Tristan Sothern, owner of Circuit Motorsports, decided that it didn’t really provide the amount of firepower they needed. So the team searched for a more technologically advanced donor. After a few weeks of looking for that perfect source, the stars aligned once again: The Craigslist gods offered the Circuit Motorsports crew a 1999 Ford Mustang SVT Cobra that was being parted out. That particular model came with a 320-horsepower, 4.6-liter V8 that trumped the old 5.0 by nearly 100 horsepower. The Cobra still had a complete drivetrain, but the owner believed that the transmission was trashed. After a three-hour drive and some haggling–like agreeing to take the car without any body panels–the team landed the Cobra for $550. Tristan and friends towed their new car home, where they quickly discovered that the transmission was, in fact, still usable. The throw-out bearing had nuked and welded itself to the input shaft; some elbow grease and a new bearing were all it took to get the drivetrain back on its feet. And so the stage was set for the Justang, the world’s first wide-body, V8-powered, rear-wheel drive Justy. Tristan will be the first to tell you that joining these two cars was not a weeklong project. He estimates that 80 percent of the time spent on the project was used just to fit the Cobra drivetrain within the confines of the Justy body. A Justy’s natural wheelbase is about 20 inches shorter than the Mustang, meaning that the Subaru’s wheel wells would need to be drastically moved. 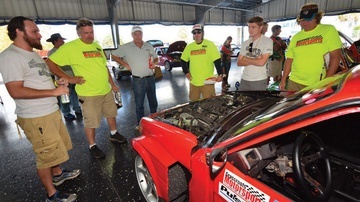 The Circuit Motorsports team placed the empty Justy body on one of their lifts, rolled the Mustang chassis underneath and lined up everything, then lowered the body to the chassis and marked any potential interference. After that it was raise, cut and repeat until the wheel wells arrived at their needed locations. All that cutting left some large open spaces behind the front wheels and in front of the rears. Where some might see problems, the Circuit Motorsports crew saw an excellent excuse to create some badass Group B rally flares. As the swap was nearing completion, the team hit another roadblock: While the engine and drivetrain could be wedged under the car, the radiator would certainly need to be relocated. There was ample space in the back of the car for it, so they mounted it high up in the hatchback, close to where the rear glass would have been. In addition to helping with packaging, the team figured mounting the radiator up there would help it grab more passing air. While mating the Justy body with the Mustang drivetrain took more time than planned, Tristan admits that most of the team’s $2015 allowance was actually spent dealing with tired and worn-out Ford components. Even though the Cobra sported just 176,000 original miles, it had spent most of its life on the salted roads of the North, so just about every bushing, seal and gasket had to be replaced to make the Justang safe and track-worthy. Adding performance parts simply wasn’t in the budget. Challenge rules did allow the team to recoup the maximum $1008 (half the total allowable budget) by selling off the unneeded Mustang pieces. When all was said and done, their total out-of-pocket cash was just $1950.24. Looking back, Tristan says that wear and age definitely cost them some power. He figures that the Cobra engine is about 100 horsepower off its rating. After the finishing touches were applied, the Circuit Motorsports crew packed up and towed the Justang to Gainesville, Florida, for our Grassroots Motorsports $2015 Challenge Driven by General Tire and sponsored by Miller Electric, CRC Industries and Pulstar Spark Plugs. Heads turned as soon as they arrived–and rightfully so. 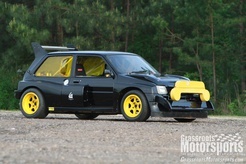 This thing looked more like one of the old Group B MG Metro rally cars than a homebuilt, Ford-powered Subaru. They quickly proved the Justang was more than just a pretty face (or as pretty as a Subaru Justy wearing homemade box flares can be). 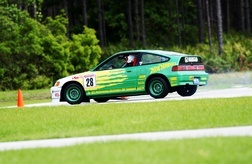 The car laid down an autocross time good for fourth place overall in a field of nearly 50 entries. Things got even cooler when guest Challenge judge Al Unser Jr. took the mighty Justang for a few autocross runs and gave the car his seal of approval, planting his signature on the dashboard. 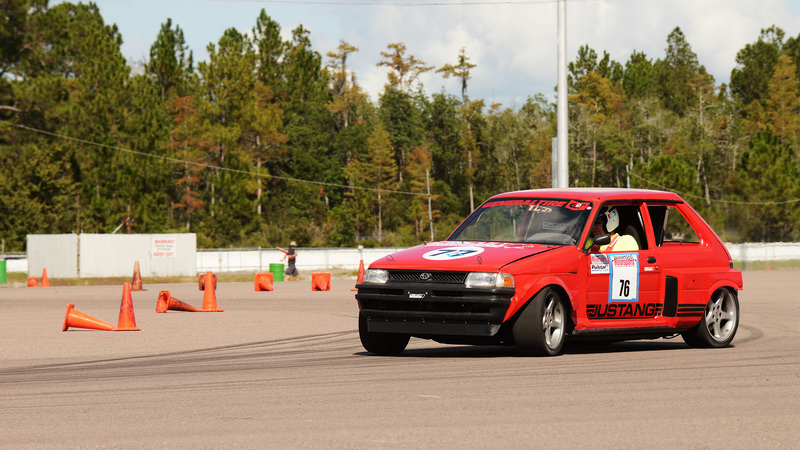 The Challenge is more than just an autocross, however. It’s about building a well-rounded car on a budget. Our popular low-buck event also includes runs down the drag strip, where the Justang posted a top time of 15.8 seconds–not an event standout and, to be honest, not as quick as a stock 1999 Cobra, but still a solid effort. The final Challenge competition was the judged concours, where the Justang’s final score put them back in the game. Their final total had them in sixth place overall–against what was probably the toughest Challenge field in recent memory. That achievement didn’t go unnoticed, as the Circuit Motorsports team was awarded Rookie of the Year honors by the Grassroots Motorsports staff. The icing on the cake? They received the Challengers’ Choice award, meaning their fellow competitors had voted the Justang as the single coolest car at the $2015 Challenge. So what comes next? Well, this crew feels that they still have more performance on the table, so they’ll be redesigning some aspects of the car–namely the cooling system–and returning for the $2016 Challenge. Join Free Join our community to easily find more Ford and Subaru articles. So where is it now? That thing is REALLY cool!!!!! I don't know where the Justang is this minute, but I do know where it will be on Wednesday, August 9, at 9 p.m. Eastern: Grassroots Motorsports LIVE! That's right, we'll have the Justang in our studio. And that studio has a lift. You can probably figure out the rest. Here, one more plug: Past episodes of GRM LIVE! can be watched over on YouTube since we now have technology and stuff. Um, yes. Sign me up. Ask them how many gallons of coolant (and how many lbs therefore) they have in that thing! Robbie wrote: Um, yes. Sign me up. Ask them how many gallons of coolant (and how many lbs therefore) they have in that thing! Our live shows are interactive so you get to ask the questions. Cool, huh? David S. Wallens wrote: Here, one more plug: Past episodes of GRM LIVE! can be watched over on YouTube since we now have technology and stuff. Cool car. Can't wait to see what they come up with next! That's not a car, that's crack. And I've got an addictive personality, baby. How Much Does a Justang Cost?